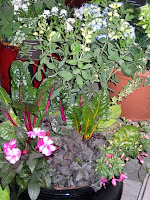 I'm teaching a class on container gardening on June 10. My info is all set, but I'm short on photos. I'm hoping my wonderful blogging friends (yes, you!) can help me out by directing me to a post of yours that shows a container, or by emailing me a photo at gardenfaerie02 at yahoo dot com. Pretty please? The container can have any kind of plant or plants (herbs, annuals, perennials, succulents, shrubs, grasses, veggies) or be a pond, hanging basket, window box, etc. Thanks in advance! Liebe Monica, müssen es Stiefmütterchen sein? Ich habe schon viele Fotos mit außergewöhnlichen Pflanzgefäßen und hübschen Pflanzen, wo ich Dir einiges mailen könnte, aber mit div. Balkonblumen oder Sempervivum, Zwiebelblühern. Sonst müssen wir den Tee ohne Blumenpötte trinken. Monica, I've never taken many photos of my garden or containers until I started the blog. It's been so c-c-c-cold here this spring, and I've been a cheapskate on the containers so far, so I don't have much in the way of photos to share. I'll see if I can get any good shots at the nursery today. (too bad I didn't see this yesterday - I was mossing and planting containers all day for gardening clients.) Anyway, there are some pretty combos for sale at the nursery - I'll see what I can do! Wurzerl, Jedes Gefaess ist gut--ich will gerne die vielseitiges von Containers zeigen. Danke im vaoraus! Garden Girl, Thanks so much for offering to snap photos at the nursery. I bet they (you!) have put together some beautiful containers. Hallo Monica, danke dass Du meinen Blog besucht hast. Fuchshandschuhe klingt ja wirklich richtig "doof". Ich finde Fingerhut auch besser und passender. Gern schau ich mal nach, ob ich ein Foto von einem Stiefmütterchen-Topf habe. Dürfen es auch Hornveilchen sein? Sind ja nur ein wenig kleiner. Danke für deinen Besuch bei mir. Ich habe leider keine Töpfe mit mixed flowers. Nur Agapanthen und Rosen in Töpfen und Gewürze. Aber Kerri von Color in the Garden hatte mehrere Posts mit wunderschön bepflanzten Töpfen. Schau doch mal da nach. Birgit, Vielen Dank für die "Handvoll" (Du hast also 6 Finger?) von Fotos!! Barbara, Töpfen mit Rosen und Gewürze sind ideal--ich will gerne zeigen, was man so alles in Töpfen wachsen kann. hi Monica, well, thanks for visiting my blog again. Keep coming back. About the scratching post you see. We wrapped "Sisal" around a tree because our cat Stella likes to use it like a scratching post and damages the tree bark. I do a lot of container gardening on my patio. This is the only container I have. I don't usually do containers. Hi Monica, I will look at my files and see what looks good and email them to you. Hi Monica, I don't have many containers but I found 2 of them for you. We had a frost advisory here also last night and I had to cover some things, but everything looked fine this morning. Monica, if you're serious about any stage containers...I just posted 2 newly planted ones. Feel free to use them. Good luck with your talk. I'll send you a couple photos early next week if that is ok. Mine are in the early stages, though, and unfortunately I don't have any pictures from last year when they were in full bloom. Selbst habe ich keine Pflanzen in Toepfe, aber meine Schwiegermutter hat einige. Falls ich dieses Wochenende dazu komme, werde ich ein paar Fotos fuer dich machen und sie dann schicken. Wurzerl, Birgit, Barbara, Andrea, Daphne, Frances, and Sabine--Thanks so much for the photos you emailed me or provided links to. They're awesome! Beckie, Rose, and Bek--Thanks in advance for offering to search for or take the photos for me! It's ironic that I'm teaching the class because even though I know the techniques, I don't grow much in containers myself. My garden is beds are pretty big, and my front porch is small. The only place for containers is my back deck, where I put out my houseplants over the summer. But I don't tend to create container gardens! And many thanks for your recent visit! Monica - you're welcome to anything at my Flickr site. Go to Flickr.com and search for gardenwiseguy. I have a few scrumptous container plant shots. Have at it! Gardening Gone Wild had a Garden Bloggers' Design Workshop on containers. Check out the links provided, especially those at Colors of the Garden. Kerri has a ton of containers.